Naxos has an area of 423 km² making it the biggest of all the islands in the Cyclades island group. Approximately 15.000 people live on the island. Naxos is a fairly typical Cyclades island. It might be a popular destination with tourists but it still is a lot better than Mykonos or Santorini. You'll still find quite a few backpackers and independent travellers. Unfortunately budget accommodation is a lot harder to find these days so their numbers decrease. Naxos is popular for many reasons. The number one reason would probably be the excellent beaches. They fine sand beaches stretch for kilometres and they are easy to reach. What I always liked about the island is the size. Naxos is so big that you can easily avoid the crowds. There are many remote areas far away from tourist resorts where you can enjoy local culture or just be on your own. Naxos has less tourism than neighbouring Paros, Santorini and Mykonos but you sometimes wonder why. The island has it all: a beautiful capital, some of the finest beaches in the whole island group, some interesting archaeological sites and one of the best hiking areas in all Greece. We recommend Hotel Soula in Naxos Town for dorms und private rooms. 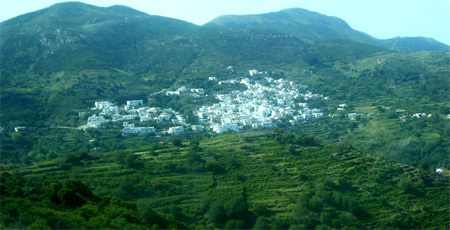 The islands capital is Naxos City. It is build around a hill. On top of the hill is a very impressive Venetian castle. The view from there is stunning and the little museum highly recommended. Around the castle you'll find the Old Town with the two parts Burgos and Agora. They are particularly pretty with their narrow streets and old houses. Old town remained more or less untouched since medieval times. The main ferry port of the island is located in Naxos City. At this stage the city is a fully developed tourist destination with about 100 hotels and very good infrastructure. 90 percent of all Naxos visitors stay in the capital or on the beaches south of it. The beach at Agios Georgios for example, with its shallow water and protected from the wind is considered one of the best family beaches in the Cyclades islands group. Fairly popular and with beautiful beaches is also Agios Prokopios. Good places to stay in Naxos Town are Hotel Soula and Naxos Windmill. They have both very cheap rooms with prices around 25 Euro per room and night most of the year. Hotel Soula has also shared, hostel like, rooms. It is the only place with dormitory on Naxos. Naxos Windmill also has apartments. Plaka until recently was an insider tip for backpackers and travellers. Unfortunately this has changed in the last few years. By now it is packed with sun beds and attracts pretty much the same audience as all the other villages. Behind Plaka is the only nudist beach on Naxos. It has a very faithful following; many people that go there would be considered regulars. They come to Naxos every year. Needless to say most of them are German. South of Naxos City are three campsites: Agia Anna, Agios Apollon and Agios Georgios. The coast with its fine beaches might be well developed, the inland (Tragea) is a completely different story. It is a paradise for hikers Here you can still experience traditional Greek culture. The villages are still relatively untouched. In most places they have some basic rooms to rent and needless to say a lot cheaper than near the coast. Tragea offers loads of nature and tranquillity. Highlight for most is the ascent to Naxos' (and the Cyclades islands) highest mountain the Zas. The view is stunning. Naxos is fairly green, especially by Cyclades standards. Unlike most of the islands it has enough water to support farming. Agriculture and even dairy farming play an important part in the local economy. Grown are mainly figs, oranges, wine, corn and of course Olives. In recent years a number of roads have been built so it got a lot easier to access Tragea. The number of visitors went up as a consequence. It now is a popular destination for organised day trips. They can be booked from Naxos City and cost about 25 Euro. Just look for "Island Tour". A small but rather nice place to stay is Apollonas in the north. It has a quiet beach, a perfect place to chill out. The bus trip alone worth's the visit. It is a two hour ride through some of the most spectacular parts of the island. Naxos has a busy port. A number of ferries per day go to Piraeus and other island in the Cyclades. At least twice a week you can get to Iraklion on Crete from here and even to Thessaloniki and Rhodes. Most boats to the so called Small East Cyclades depart from Naxos port. That includes Iraklia, Schinoussa, Koufonisi und Donoussa. The trip is an adventure in itself. The small ferry is the Express Skopelitis. It goes from Naxos to Amorgos pretty much every afternoon. In the morning it goes back from Amorgos to Naxos. It stops at most of the small island but (like on Donoussa) not necessarily every day. From Naxos port you can also book day trips to Mykonos, Paros, Santorini and other islands. Very popular is the day trip to Delos and Mykonos. On each island you can spend about 3 hours and costs only 40 Euro a person (spring 2008). That's not bad. Naxos has a pretty decent public transport system. From Naxos City there are busses to more or less every village on the island. To more important places like Apollonas busses go frequent. The beaches in the south have a regular bus connection. During the season the bus goes every 30 minutes. Off season there are fewer busses but even then a regular bus connection is maintained. Despite its size and beauty Naxos attracts far less tourism than other islands (and most of the regulars are very happy about that). The main reason is the tiny airport. There are no international flights to the island. The only way to get there is via Athens and then with one of the small planes or to Mykonos and Santorini and then by boat. The ferries from there go frequently so it's no real problem but of course it is a hassle. An interesting detail is that the small airport on Naxos doesn't have a bus stop. You can walk to the main road where the busses from Agia Anna stop but it is inconvenient. The taxi drivers are well aware of that and introduced a little airport charge. A taxi from there cost easily 15 Euro although it is only 5 kilometres. There is nothing you can do about it so don't waste your time getting upset about it. Popular things to do on Naxos are horse riding and all kinds of water sports. South of Naxos City in Agios Georgos is the best spot if you are interested in wind and kite surfing, sailing and other activities like hiking and mountain biking. Best check Flisvos homepage (http://www.flisvos-sportclub.com/).